The Danes success with speakers is something to behold. Ever since the Dynaco A-25 of the 1960s (made by SEAS), Denmark has been the source of many great speaker systems, and of raw drivers for long before that. Dynaudio, one of Denmarks largest producers, is also one of the youngest; the firm, established in 1977, offers a broad array of speaker systems for home, car, and professional applications. Dynaudios Audience series constitutes the entry level of their speaker offerings, but that doesnt mean cheaply made. The subject of this review, the Audience 42 ($850 USD per pair), is surprisingly heavy for its diminutive size, and surprisingly lovely. The Audience 42 is small -- a mere 11" high by just under 7" wide and 10" deep. The "midwoofer" (Dynaudios word) is 5.9" in diameter, the fabric-dome tweeter just over 1". Each speaker weighs 10.5 pounds. The stated sensitivity is 86dB, the frequency response 53Hz-28kHz, +/-3dB. The 42s nominal sensitivity is 4 ohms, with a range of 3.7-18.7 ohms over the entire audioband. The review pair was clad in a handsome rosewood veneer; the Audience 42 is also available in cherry, maple, and black ash. The rear panel contains a pair of gold-plated, recessed, multiway binding posts, as well as a 1.75" flared bass port with a matching plug of high-density foam. Dynaudio suggests that the Audience 42s be set up to describe an equilateral triangle with the listening position, and that they be placed no less than 0.5m from the front wall. If the 42s must be placed closer to the wall, Dynaudio suggests plugging the ports, which turns their bass-reflex enclosures into sealed boxes. I found that the bass tightened up a bit with the ports plugged, and probably didnt descend as low as the quoted 53Hz. Most of the time I had to use the plugs, but didnt think badly of the 42s for that. I placed the 42s on 31"-high Sanus speaker stands, and used Blu-Tack to secure them. The speakers gray grillecloth is secured by four posts. I heard very little difference in sound with the grilles removed, and so left them on for most of the review period. Most of the time, I used the Audience 42s with my office system: JVC L-F41 turntable with Grado Green cartridge, Onkyo DX-6800 CD player, and Boston Acoustics Recepter Radio HD feeding a McIntosh C27 preamp and Carver TFM-15CB 100Wpc power amp. The low bass was handled by an Advent ASW 1200 subwoofer driven directly from the McIntoshs center-channel output. Speaker cables were 16-gauge Recoton/ARs. I found the best crossover setting for the sub was about 90Hz. I also used the Dynaudios with my living-room system: NAD C525BEE CD player and NAD 712 receiver with a PSB Subsonic 5i subwoofer. Here, I removed the Audience 42s port plugs and set the crossover frequency between sub and satellites to about 80Hz. Overall, I found the Audience 42s integration of its midbass and treble to be seamless. It sounded about as close to a point source as Ive heard. With or without the port plugs, the midbass had some slam and punch -- with lots of rock music, the 42 could get up and boogie. Yet it didnt sound odd reproducing ethereal choral music. The 42 handled the dynamics of full-bore classical music, yet also seemed to delight in such intimate music as cabaret performances, small jazz combos, and solo vocals. When I played the Hoedown from Aaron Coplands Rodeo, as performed by the Los Angeles Guitar Quartet on their Labyrinth [CD, Delos DE3163] in a fine arrangement for four guitars, the Dynaudios displayed outstanding imaging: the two main guitars on left and right, with appropriate fill-ins between. Even through fairly good speakers -- including my own Celestion 3s -- the articulation of the individual pluckings of strings in this very percussive performance can often be lost or glossed over. Not with the Dynaudios: their very fast reproduction made this music sound wonderful. "Be Cool," from Claire Martins The Waiting Game [CD, Honest/Linn CD 5018], is a favorite of mine. Ive been a fan of this smoky-voiced British chanteuse, who only now is being properly introduced to American audiences, since I heard a track from her debut album on an obscure jazz station. Once again, the Dynaudios offered perfect imaging that even extended past the speakers outer side panels. There was good depth, too -- the bass and drums were suitably in the rear, and the guitar and piano were just behind Martin. Manhattan Transfers cover of Weather Reports "Birdland," as heard on The Manhattan Transfer Anthology [Atlantic/Rhino D200146], was instructive. In this tour de force vocal performance, the group was well integrated with the spare instrumental accompaniment, but when each singer soloed, he or she came across brilliantly. (Janis Siegels scatting of her closing notes is nothing short of amazing.) Compared to the Celestion 3s, the usual speakers in my office system, the Dynaudios showed a bit more restraint, even without the port plugs -- as if they were following along with the score. I was impressed by the accuracy of the sound. On "The Shadow of Your Smile," from In Tune, by the Oscar Peterson Trio and the Singers Unlimited [CD, MPS 821 850-2], the harmonies are some of the best ever. Peterson is ever sensitive to whomever he accompanies, and here he does a delicious piano solo as well, accompanied by the Singers with heavy echo. The Dynaudios reproduced all of this just as I wanted it. Maybe thats subjective, but doggone, they sounded wonderful. By contrast, the Celestion 3s, as good as they are, sounded just a touch artificial in comparison: a tiny bit muffled, although, given the price difference, still in the ball game. I then listened to Erich Kunzel and the Cincinnati Pops perform Leopold Stokowskis arrangement of J.S. Bachs "Little" Fugue in G Minor, from The Fantastic Stokowski [CD, Telarc CD-30338]. The piece begins very softly, gradually adding members of the reed and string sections. By a third of the way through, the basses and cellos have joined in, and the overall volume has increased; when the violins then enter, the volume increases significantly. But even when the first violins reached for the heavens, the Dynaudios reproduced them without sounding screechy. This was a real ear-opener, with, again, great articulation and great imaging. I couldnt imagine much better imaging from any other pair of speakers. But dont play the Audience 42s too loudly -- they began to break up at about 105dB. Then again, so do my ears, and the Celestion 3s bail out even sooner. With full orchestral music, the Dynaudios sounded a wee bit confused, though not so much that Id kick them out of my listening room. "Finally Found a Reason to Believe," from Art Garfunkels Fate for Breakfast (Doubt for Dessert) [LP, Columbia JC 35780], sounded very good through the Dynaudios. Garfunkel was in front, but the backing voices were up close too -- perhaps an artifact of my JVC L-F41 turntable and Grado Green cartridge. The accompanying guitars were nicely up front, and the spread was very left-and-right. The overall reproduction sounded very natural and very satisfactory. If you want to hear how your system reproduces a nice variety of acoustic music, mostly guitar and vocal, get Jazz Moods: Twilight in Rio [CD, Concord CCD-5224]. My wife and I treasure this low-priced compilation of tracks by mostly great artists who record for the Concord Jazz label: Charlie Byrd, Karrin Allyson, Toots Thielemans, and a few Ive never heard of, such as Manfredo Fest, Tania Marie, and Carlos Barbosa-Lima. The sound on this disc is excellent. If you listen to the attacks on the guitar strings and the general sound of Tootss harmonica (he appears on several tracks), youll get an idea of how well your speakers can handle voice and some unusual instruments. With the Audience 42s, I was treated to a great sense of intimacy with the performers. These werent the ultimate "right in the room" speakers or recordings, but both were darn close. Listening to Twilight in Rio through the 42s, both with my NAD living-room system and my hodge-podge office setup, I was very pleased. Still, the Dynaudios didnt like being overloaded by really bad recordings, such as vintage Motown singles. Playing Edwin Starrs "25 Miles," the 42s began to overload at about 100dB. Those badly overdriven Motown recordings sound as if recorded on some wind-driven piece of 1960s Japanese junk by an engineer had no concept that "0VU" means tape saturation. But thats also part of their charm. Youll never hear a recording as raw and natural as an early Motown recording. All in all, the Dynaudio Audience 42 is a fabulous small loudspeaker. Over the years, Ive been exposed to any number of fine small speakers -- the KEF Coda 7, Celestion 3, Advent 3, Monitor speakers from the UK, and PSBs Alphas and Minis -- but I dont believe Ive heard one as fine as the Audience 42. 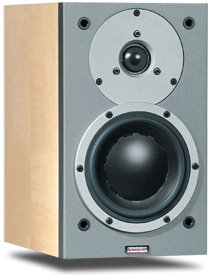 Its not inexpensive; for $850/pair, you can find any number of other good floorstanders. But few offer the immediacy of performance and the smooth character of the Audience 42. If it fits your budget, dont miss hearing it. I believe youll find it among the best youve heard.